Taking your car repairs into your own hands can be a fun and rewarding experience. It is an excellent way to learn more about cars and it is an even better way to save yourself some serious cash. Handling the car repairs yourself can save you as much as 50 percent on the cost of the repairs. Those are the types of savings that everyone can benefit from; mechanics are not necessarily greedy, it’s just that they just have to pay for all of their expensive overhead. When you take the repairs into your own hands, you will not be faced with half of those expenses, but you will be faced with one challenge that even an experienced mechanic faces: safety. There is no such thing as being too safe when it comes to automotive repairs. Proper planning and proper safety techniques can save a life. On average there are over 140 mechanics killed each year while they are on the job. Statistics also show that there are over 15,000 automotive repair injuries reported every year. These statistics only include working mechanics, not the millions of do-it-yourself mechanics out there. Safety should be the very first thing anyone considers when handling automotive repairs; here are some safety tips that everyone should follow. Inexperience is often the number one cause of accidents related to automotive repair. Cars are no place to start playing guessing games. You could very easily get shocked, burned or worse if you start trying to guess what is going on under that hood. It always helps to have a partner when you are doing repairs, but it also helps to have some basic safety tools around. A fire extinguisher will come in handy, as well as some emergency eyewash and cleaning supplies. Make sure that you have the proper safety gear on hand just in case. Preparing yourself for automotive repair is a simple task, but it is the one that is often overlooked. Wear some old clothes that you don’t mind getting dirty. Do not wear any loose-hanging clothes as these could get caught in moving parts. If you have long hair, make sure that you put it under a hat or secure it so that it stays out of the way. Remove any jewelry that you may be wearing; this includes necklaces, rings or earrings. Always wear eye protection, because it only takes one second to lose an eye. Automotive repair tools are only as good as the person using them. Using the wrong tools will definitely cause some problems. Each tool is supposed to help make the repairs, not be the cause of injury. 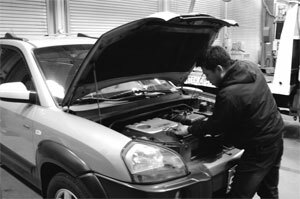 Make sure that you fully know and understand how to operate every single tool that you will be using during the repair. Having a repair buddy is good support, but this type of support refers to having your vehicle properly supported. Over 50 percent of repairs will require a vehicle to be lifted off the ground. This is where repairing an automobile can get deadly. Car lifts help eliminate any possible accidents; use them! Never crawl or stand under a vehicle that is not properly supported. The average vehicle in America weighs a massive 4000 pounds. That is two tons of metal. If it were to fall, the outcome would not be pretty. Disconnecting the battery does a lot more than prevent dangerous shocks. It can also prevent fires, dangerous shorts, damaging more parts and accidental deployment of the airbags. No one wants an airbag to go off in their face, after all. There are very few automotive repairs that will actually require that your vehicle be in neutral and there are even fewer repairs that will require your vehicle to be running. It is all too easy for two tons of metal to roll. Don’t let this happen to you! These are just some basic tips that will help you repair your vehicle and live to see another day: be sure that you always use common sense any time you are tinkering away under the hood of a vehicle.